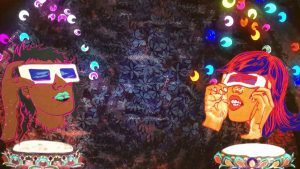 In a new installation at the Rubin Museum, Brooklyn-based artist Chitra Ganesh interrupts the museum’s permanent collection of Himalayan art with animated videos that draw directly from images in the galleries. 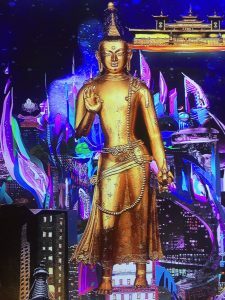 Boddhisatvas, tantric deities, and buddhas from the collection are transported through history to the present, adapted into futurist landscapes where figures are drawn in bright neon lights, visions are beheld through 3D glasses, and buddhas can be androids. Roaming through the galleries, viewers can see tapestries, sculptures, and paintings from over 1,500 years of Himalayan history. The collection is gorgeous, filled with rich color and delightful visual details – a smiling skeleton swimming in a cool blue pond, flaming haired deities clad in tiger skin and bright jewels digging their heels into the backs of bodies laying face down on gold leaf ground. The videos appear subtly, their light slowly filling the projected screen once they’ve detected the presence of a potential viewer. We watch the figure of Mandarava, consort to Padmasambhava, the Second Buddha, wake from a dream and travel through bardo, that liminal space between death and rebirth. Her dreams takes her through a tunneled landscape. The light is dark but a red sun emerges behind a mountain peak in the distance. The dimensions are flattened as though we’re watching a puppet theater. Wrathful deities with animal heads stretch limp bodies, coyotes eat their innards. Their fearsome exteriors are protective, removing the obstacles to enlightenment. The animation moves quickly through the landscape and we find ourselves flying towards a cave surrounded by a watercolor rainbow. Inside the cave, Mandarava finds Padmasambhava. The pair sit cross legged watching a series of mandalas flash before their eyes. 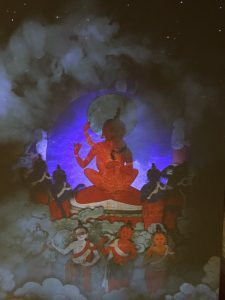 A Buddha raises their spiritual selves into a tantric position as their terrestrial bodies watch on through 3D glasses. They transform into deified selves and merge into one. The screen swirls into psychedelic color, dissolving into suffusive, hot blues and pinks before it turns black. 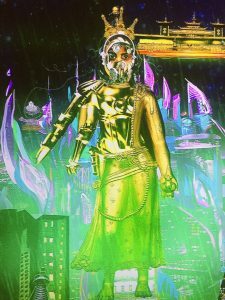 The piece, Rainbow Body, draws on imagery from the depiction of the Maitreya adjacent to the video. The animation collages images from the gallery but the illustration and the physical movement through a space is all Ganesh’s interpretation made possible by modern technology. We are reminded that the history this collection displays continues to have ramifications in the present, that in this museum built to house art and artifacts of Buddhist and Hindu histories, we might also consider their presents and futures and how they might be represented differently in a current moment. Donald and Shelley Rubin founded the museum with artworks collected primarily for their aesthetics. They opened the museum in the building of what was once the department store, Barney’s New York. Now, the gilt railing of the marble staircase spiraling through the center space guides visitors to the artifacts of Asian history rather than to designer shoes and handbags. The video interventions vivify the space, reminding us that while they are beautiful and emotive, these artifacts are not stationery objects to be simply observed for that beauty. 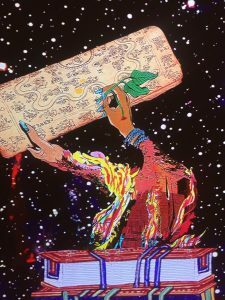 They evoke stories and traditions, framing ideas that remain as relevant today as they have been for centuries to remind Western viewers who might see a stagnant region mired in an antiquated past that these cultures are very much alive. In an interview with Guernica, the artist admits that despite her family background and the recurring exploration of Hindu themes in her work, she is not religious. Her engagement with South Asian history and religion is not out of a devotional instinct but rather a form of questioning narrative traditions and mythology. Her visual references to that canon represent a desire to engage with history, to bring historical conversation to a contemporary moment. It is no coincidence that all five video works refer to the Padmasambhava, the Second Buddha who brought Tantric teachings to Tibet, or the Maitreya, the Future Buddha who will come to the world when the teachings of the first Buddha are lost to usher in a new age. They acknowledge a continuation of Buddhist philosophy, remind us that it encompasses its past, present, and future simultaneously. The videos situate themselves the place where historical ideas meet the contemporary moment. The projection of Silhouette in a Graveyard emerges behind a late-18th century, Mongolian sculpture of the Maitreya. Clips of Black Lives Matter protests, marches advocating to free Palestine, to end Western occupation in the Middle East and more are framed in the outlined torso of the Maitreya. The background alternates between celestial skyscapes or lotus blossoms and images of climate disasters, torrential hurricanes and blazing forest fires. The images of today’s world evoke the apocalyptic scenes that may premonition the arrival of the Maitreya if we were to consider them with the Buddhist meta-narrative in mind. They offer a proposal of how we might understand the role of that figure in a moment where humanity seems to be at a crossroads of sweeping change to both our geopolitical systems and our environment. Ganesh has come under attack for what Rajan Zed of the Indian American Association of Northern Nevada called a “pillaging [of] serious spiritual doctrines and revered symbols” in ArtDaily. He was referencing a mural Ganesh exhibited at the Brooklyn Museum of the Kali, the Hindu goddess of death, time, and doomsday. She wears her traditional garland of human limbs, her skin is tinged blue, and she maintains her normal six arms. Breaking from historical depictions, her head is replaced with a clock with no hands and she has three breasts and three legs. What Zed calls a frivolous and silly depiction of a historical figure, Ganesh sees as a chance to reimagine the boundaries of conventional Buddhist and Hindu imagery, a chance to transform visual tropes and integrate them into the concerns of a new moment. Zed’s argument relies on the idea that the imagery of South Asian religious history are entirely spiritual in nature, that they are meant to be used for religious purpose and not as decoration. But remember that until relatively recently, all art was religious. The questions art sought to answer were religious ones. And even in that religious art history, they way the images were depicted and the stories that were told often changed. Should contemporary artists not be allowed to engage with those themes and their visual cues? To reconsider those narratives? And is it okay for those reconsiderations, especially if they are secular in nature, to be housed in museums rather than religious spaces, especially if those questions they once answered are now debated in primarily secular spaces? The answer to those questions depends on how you might consider this blurred line between a religious artifact and an art object. Ganesh’s work contends that these pieces, in addition to holding religious significance and carrying certain narratives, are formal art objects whose visual vocabulary might be used to frame a more current story. Through her interventions at the Rubin, Ganesh considers the language of a South Asian art, using it as a tool to consider a world that has changed considerably since that language was created and to speculate further on where that world is going. In doing so, she has created a series of videos that vivify a history of a region, reclaiming it from a Western gaze that would have claimed it was obsolete. Chitra Ganesh’s work is on view at the Rubin Museum of Art until November 4, 2018.